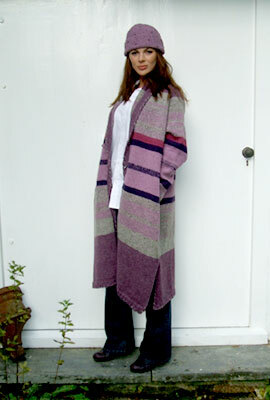 This flared coat with bold stripes, raglan sleeves and turned collar has side pockets, side splits and binding round the edge. It is fastened with vintage buttons. Worn with hand-crocheted pull-on hat. These hats are made in colours to match the coats and jackets. "I don't only wear Gillian Osband Knitware, I collect it, I've got fifteen pieces and love every single one of them."